Gray skies hovered above flowered fields altering between drizzles and downpours during all of this past week. Temperatures fluctuated from the tip-top of hot before crashing to cool. As I gazed out the glass to the back of my yard, sheets of light, steady rain continued to fall, creating a small stream. The shallow water swirled around a row of tall pines toward the willow tree. Suddenly a flash of colored honey caught my eye. As if Walt Disney himself waved his magic wand from above, a family of four left their little forest land to wander upon the soft carpet of my lawn. 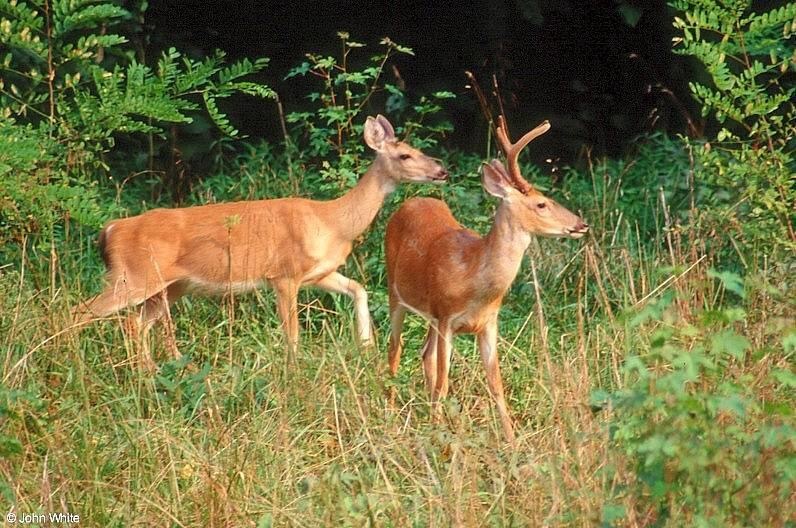 One by one, a young buck of fuzzy horns, together with his beautiful doe and two spotted fawns slowly began to eat foliage while heaven’s showers fell upon their backs. She was on high alert, eyes darting in all directions while twins bounded out of sight. Suddenly, spindly legs scampered around the corner. The doe came closer to my patio, trying to reel her babies in, but they were having none of it. Instead, they began to tease her with play. She did not appear happy. Her tail of white raised straight up while she stomped her right front hoove. 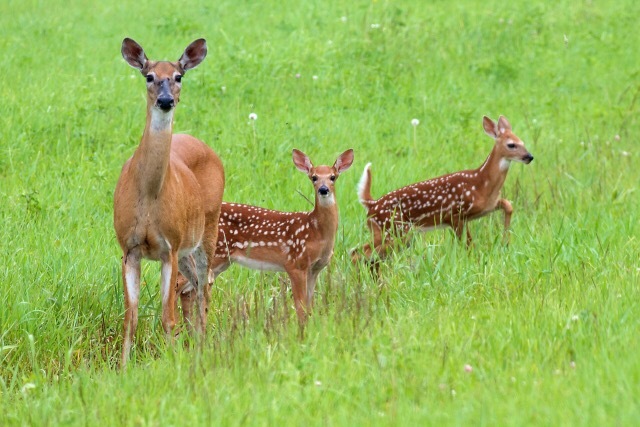 The fawns continued running back and forth in a zig-zag pattern right beneath the wet of their mother’s shiny black nose. Finally, the doe did something I had never seen before. She began to PLAY with the twins, imitating them two or three times by taking a few steps forward before backing up to wait for them to do the same. Which they did, before playfully running to and fro in front of her. The rain continued to fall, steady drops from the sky soaking all below, incouraging life to survive and thrive….and yes, even take time to play. Posted on July 8, 2016 by kcg1974 •	This entry was posted in Animals, Beauty and tagged Animals, Beauty, Love, Nature, Play. Bookmark the permalink. 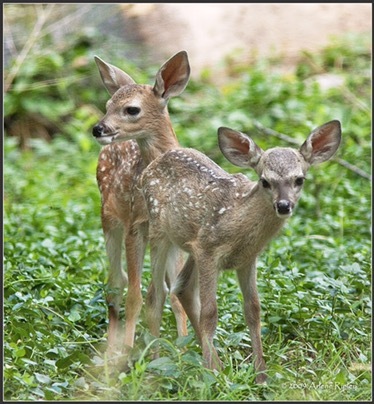 It was such a delight to watch them, and I had never seen a doe play with her fawns before. Thank you for reading. What a magical moment, Kim — and beautifully told. Disneyesque indeed! Huge hugs. Thanks for reading, Teagan. Such love in watching the mother play with her fawns. Yes, God has the wand. So true. I am so thankful to HIM. Bless you for your words. It goes both ways, Steve. Thank you so much with many blessings to you and yours. Happy weekend to you. It certainly does! Enjoy your weekends and your life as you consider how precious it is! Thank you, Steve. You too! You are welcome. You’re quite a writer! I fed a chipmunk a peanut. I am surprised that he didn’t shy away from me bc most animals do… he just took the nut from me with his tiny paws.. I just melted with the cute. What a joy….I have a fun story of my own to share…I was taking an outdoor sauna with a large plexy glass window facing the woods of northern Michigan when all of sudden 2 young bucks ran out, they were running back and fourth taunting one another and playfully rubbing their tiny, stubby horns together. we watched them play for a good long time, & though it was several years ago it remains a very pleasant memory, innocent and natural fun! This is the best memory, and a great story to share. What a wonderful sight to see, especially while taking a relaxing sauna! I’d give anything….! 😘 Thank you so much for reading and commenting. I look forward to reconnecting soon. A gift to me to be sure. Blessings and love to you, Sue.